While an annual traveling festival that concluded on Sunday in Ho Chi Minh City witnessed a drop in the number of visitors this year, participating travel agencies all posted increased sales of outbound packages, even those with hefty price tags. More than 250,000 people visited the Ho Chi Minh City Travel Festival 2019, with 12,700 of them purchasing tours at the April 11 to 14 event, according to the municipal tourism department. The number of customers increased by 41 percent in comparison with last year’s festival, as many showed interest in packages available for the upcoming holiday, when Vietnam observes Reunification Day and Labor Day on April 30 and May 1. 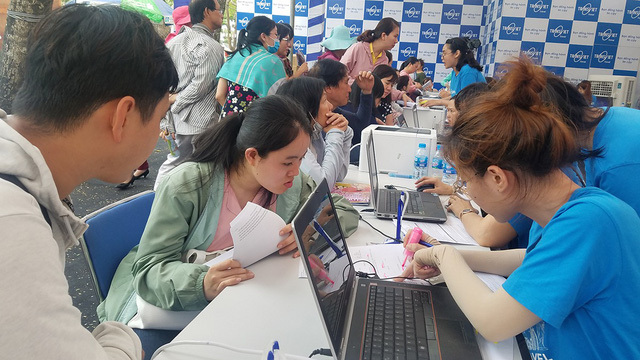 Leading travel agency Saigontourist said it sold tours to around 4,000 customers during the four-day event, exceeding the company’s expectations. Even costly packages, such as a VND 100 million (US$4,300) tour to four Scandinavian countries or four Balkan nations, were able to attract buyers during the festival. Travel agencies said they have to offer additional packages to meet rising demand. BenThanh Tourist also said that even though the number of visitors dropped, their revenue surged in comparison with last year. Some of the best-selling tours are those to Russia costing around VND55 million ($2,200) per person, or the ten-day France – Switzerland – Italy package fetching VND61 million ($2,600) and seven-day tour to the U.S. at VND43 million ($1,850). In the meantime, TransViet added that the number of tours to China doubled the company’s expectations, while VietTravel claimed that around 3,500 customers purchased trips from the company, against a target of 3,000. Tours to Japan, South Korea, China, and Thailand drew the most interest, according to the travel agency. Domestic tours to such famous coastal city as Da Nang, Quy Nhon and Nha Trang also sought well thanks to the growing demand for inbound travel during Vietnam’s major holidays later this month. Many customers were also interested in one-day tour to the Mekong Delta. This year, the festival also aimed at encouraging tourism within Ho Chi Minh City, with the introduction of 700 tours to Can Gio Mangrove Forest located 40 kilometers from the city center, 220 tours to Cu Chi District on the outskirts of the city, and 200 city-tour tickets. Tour organizers reported a combined revenue of around VND120 billion ($5.17 million), some 45 percent higher than last year.